The entry-level DSLR market has slowed in terms of product releases in recent years. Indeed it's taken three years for Canon to out the 1200D - that's Rebel T5 for our American friends - and while we don't mind waiting for the right kit to come along we do question whether the market has changed unrecognisably in that period of time. 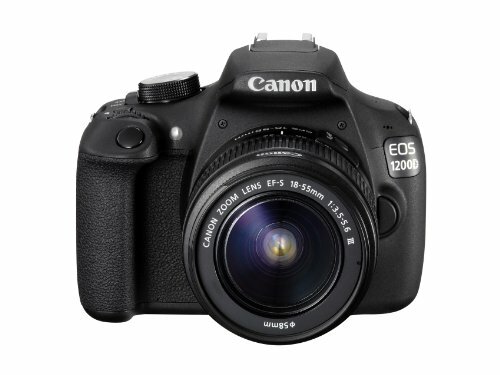 The update to 2011's 1100D, the EOS 1200D is all about hitting an accessible price point. A lot of its features mirror that of its pricier, more feature-laden peers from the EOS range but wrapped in a more budget, plastic finish. Performance relatively assured, then, the bigger question is whether a comparable compact system camera might appeal more. Can the budget DSLR still hold weight in 2014, and has Canon got the balance right in the 1200D? If you're thinking of buying a DSLR then you'll need to predominantly use it via the viewfinder. If that's not what you're after and you want to use the screen like you would a compact then you will be better off looking at a compact system camera instead. That's the shift in expectations in 2014: although the 1200D does offer a live preview mode via its rear 3-inch, 460k-dot LCD screen, it's just so far behind what an equivalent from Panasonic, Olympus or others offer that there's no competition. However, when it comes to viewfinder use the 1200D excels given its price point. The diamond-array 9-point autofocus system has reasonable coverage of the scene at hand, the 95 per cent field of view is ample (this means the outermost five per cent of the frame won't be seen in preview but will be captured in shot), and red-illumination to confirm focus is decent. Ok, so it's not going to match the larger, full field-of-view pricier competitors, but at this price that won't be offered anywhere. Some compact system cameras offer electronic viewfinders, whether built-in or as accessories, which are like mini LCD screens to look at. These are absolutely fine, sometimes excellent, but there's a certain experience in using an optical viewfinder as found in the 1200D that, arguably, delivers a better experience - no image noise in low-light, no ghosting when moving the camera around and so forth. To look at the Canon 1200D is the "painting by numbers" model of the DSLR world. It's come from a long heritage so Canon knows what to feature and how to position various controls and dials. We can't really complain about anything - it fits sensibly to the hand, the top thumbwheel is easily accessible and the quick access buttons and rear d-pad are all clearly labelled. Lots of boxes ticked, but excitement-o-meter not particularly high. The design is also rather plasticky in its build. Now £400 isn't going to bag you gold-plated wonderment, granted, but even some budget competitors are sharpening their designs and featured materials which makes the 1200D look budget. It's not offensive, more functional - a slice of DSLR vanilla. But that's just fine. We've been happily shooting with the 1200D at London Zoo, in Los Angeles, California, and even shooting a singer post-gig using a 24-70mm f/2.8 lens worth considerably more than the camera body. How's that for versatility? Herein lies one of the 1200D's best features: its EF-S lens mount. There are bucket loads of lenses to offer different views onto the world once attached to the 1200D. Whether fish-eye, wide-angle, pro portrait, significant zoom or beyond, there's something for every need. However, the 1200D comes boxed with a basic 18-55mm f/3.5-5.6 lens as standard. If those numbers mean little to you, they relate to how much light can enter the camera, and with this kit lens the more you zoom the less light that can enter. This can cause issues with which settings the camera uses, sometimes resulting in an excessive exposure time and, therefore, blurred subjects as a result. The lens is defiantly average and the biggest limitation to the camera's overall capabilities. But all is not lost. Pay for a better lens and we found the 1200D to perform really well. Think of it as the ideal footing to get on board with the Canon EF mount and it's happy days; the first step to the rest of your DSLR life. But choose brand wisely as Canon lenses won't work with the competition, so a switch to Nikon, Sony, Panasonic, or whatever later down the line would be unfeasibly expensive. To aid with your learning of all things cameras and lenses the 1200D also promotes a companion app for Android and iOS. It helps educate and instruct you about how the camera works, in addition to general shooting and photography knowledge. It's a nice enough idea, a bit like an interactive manual. But despite this technological feature, there's no built-in Wi-Fi in the 1200D, which seems an oddity. Ignoring the woeful live view experience, stick to the viewfinder and the 1200D does a grand job at this entry-level market position. There are a variety of autofocus modes that can be toggled through using the dedicated focus button and top thumbwheel. Everything is shown clearly on the rear screen so you know which of the nine points are in play and how they're being used. Use a single user-positioned point, or use the full whack - it's up to you. AI Focus, to give it Canon's unduly complex name (for an entry-level product anyway), means a single depth of focus is found, locked and then shot with a press of the shutter. AI Servo is Canon's way to describe continuous autofocus, i.e. a point of focus continually updates as the subject moves. The latter isn't lightning fast, but it's workable. Speed isn't the 1200D's overall strong point really. From the so-so continuous focus to the ability to bang out just three frames per second of continuous capture (and not in AI Servo) it's not a camera best suited to fast-moving action. We often found shooting moving subjects was tricky with the kit lens because of its limitations, sometimes resulting in blur due to movement. As the 1200D is a DSLR proper, and doesn't rely on as much electronic gubbins as its compact system camera competitors, we found its battery life to last for longer than much of the competition. We've seen some entry-level models (and even mid-level ones) drop out after 350 shots in a single charge. The 1200D, on the other hand, is said to achieve 500 shots per charge - a figure that seemed consistent with our use. Of all its highs and lows, one thing the 1200D assures is image quality. With the same 18-megapixel sensor as found in its nearest peers, the resulting quality - which, in part depends on the lens - has the capacity to be just as good as a camera more than twice the price. The camera offers JPEG files which can be viewed straight after shooting, or shoot raw files if you want to dig in and losslessly adjust shadow, highlight, exposure, colour data and so forth using your computer. We tend to shoot both at the same time - but a large sensor camera such as the 1200D is a great place to learn the benefits of raw capture, even if you don't need to use it for each and every frame you shoot. Yes there are limitations with the kit lens, but having shot using a couple of different lenses we've been impressed with the images to come from the 1200D. There have been one or two colour balance oddities here and there, and the JPEG shots can suffer for overzealous processing in some instances, but otherwise it's all good. To combat low light conditions a camera needs to "boost" the signal captured to generate an accurate exposure. This impacts image quality, however, as grain and colour - shown as image noise and colour noise in the image - can rear its head and impact the way a shot looks. The more a shot is "boosted" the higher its ISO sensitivity is said to be. The 1200D is able to shoot from ISO 100 to ISO 6400 as standard and we've found results to be usable throughout. ISO 6400 can be a bit on the soft side, and the JPEG files are processed in a way that smoothes out the grain to excess - we prefer the more pronounced grain in the raw shots at the lower ISO settings. It's these lower ISO settings that are of greatest use too. Sun-kissed fields and penguins at the zoo doing their thing were no problem to snap with ease and the results are rich in detail and clarity. Right up to ISO 800 there's little presence of image noise, including in darker shadow areas. It's only upwards of four-figure ISO settings that we've spotted slight haze of colour in, for example, a sheep's woolly coat. Overall if it's image quality that you're after then say hello to the 1200D. It's got this box well and truly ticked, particularly when paired with a decent lens. The Canon EOS 1200D holds enough weight to keep the entry-level DSLR market relevant, although with compact system cameras adding an additional option it's not as cut and dry as it once was. If you want to use the rear LCD screen to take pictures then forget about it. The lack of Wi-Fi and some other mod cons also seems amiss in today's market. But if you're after an affordable viewfinder-based option then the 1200D has definite plus points, in particular its price point. It might be plasticky and isn't a giant leap ahead of where the earlier 1100D model was, but when it comes to all-round performance and image quality the Canon 1200D is a solid device.